Introduced in 1973, the ZG Fairlane kept most of the body panels of the ZF, but it had a new egg-crate-style grille. A manual transmission was no longer available on a Fairlane, and 351 V8 models now had four wheel disc brakes. Both models were given heavy duty shock absorbers which resulted in a softer ride and improved handling. A push button radio was standard, and in September 1975 equipment was upgraded. Both Fairlane models now featured a vinyl roof, bumper overriders, more carpeting and improved interior trim. By the mid 1970s, the excitement of the ZF/ZG Fairlane died down, because of criticism that it looked too much like the smaller, cheaper Falcon. 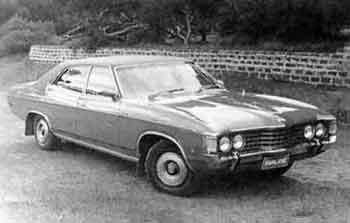 Launched before the XB Falcon and ZG Fairlane in August 1973, the new P5 LTD became Fords new flagship model, replacing the fully imported Galaxie. The giant LTD had an even longer wheelbase than the Fairlane. This was the most expensive car ever produced in Australia at the time, and was brought out to compete with European and American imports, which dominated the top end of the market. The LTD (Lincoln Type Design, not Limited) was available as a four door limousine or two door Landau (based on the Falcon hardtop). The LTD looked similar to the Fairlane, however the boot was squarer. LTD and Landau featured high intensity headlights which were concealed behind vacuum operated grille sections. Both LTDs used XB Falcon mechanicals, namely the 351 V8, and these were the first Australian cars with four wheel disc brakes. Other safety features included inertia reel seat belts and a collapsible steering column. Standard features consisted of variable ratio power steering, power windows, air conditioning, tinted windows, remote control mirrors, 24 hour clock and steering column lock. Leather trim was optional. The Landau didnt make it to the next model. It was a slow seller, managing just 272 cars. How do I know it's a ZG? Update of ZF brought egg-crate grille, Ford badge in right side of grille, Fairlane badge in centre of bonnet. How do I know it's a P5? Headlights hidden by full width grille, vinyl roof, parking lights in bumper, side indicators on rear guard, squarer boot. (Limited Edition) 302 V8, badge on C-pillar, November 1975. (Limited Edition) Side stripes, vinyl roof, Town Car badging, folding umbrella, under dash storage bin. $12418, May 1975. Independent angle poised ball-joint type, heavy duty coil springs with hydraulic shock absorbers, torsion bar ride stabiliser with antidive geometry. LTDs have wish-bones and anti-roll bar. Floating caliper type power assisted discs, ventilated 11.25 inch diameter. LTD servo assisted. Fairlane Rivals: Holden HQ/HJ Statesman, CJ/CK Chrysler.